If you live in a midsize city or battleground state, you are now more likely than ever to see pro-Trump propaganda and conservative spin on your local news -- just in time for the 2018 election season -- thanks to conservative media giant Sinclair Broadcast Group. We’ve already tackled Nevada, Tennessee, New York, Florida, Virginia, and Ohio. Now, we’re taking a look at California. There are seven key congressional district races in California, most labeled by Cook Political Report as toss-up or “lean Republican” races and some targeted as key races by political groups. One currently includes several communities with Sinclair news stations, and the rest may have at least one Sinclair station before Election Day. House: California’s 21st congressional district (CA-21), in the central San Joaquin Valley, was considered a “likely Republican” race by Cook Political Report as of publication, but it is one of the Democratic Congressional Campaign Committee’s targeted races for 2018. Incumbent Republican Rep. David Valadao faces Democrat challenger TJ Cox. House: There are six other key House races in California, many in districts that are part of Orange County and/or the greater Los Angeles area: CA-10, CA-25, CA-39, CA-45, CA-48, and CA-49. 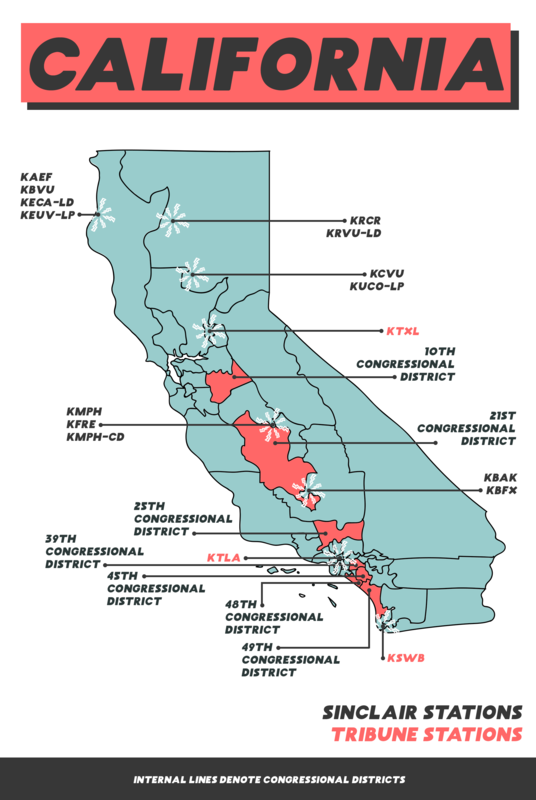 Sinclair controls KMPH (Fox 26) and KFRE (CW 59), two main local stations in the Fresno area, including parts of CA-21. It also owns KMPH-CD, a separate, small station that relays Fox 26 broadcasts to certain parts of the media market. All three stations share a main studio address in Fresno. Fox 26 regularly airs at least some of Sinclair’s “must-run” content, including some nationally produced news packages, fearmongering “Terrorism Alert Desk” updates, and “Bottom Line with Boris” pro-Trump commentary segments. It also aired the recent anchor-read scripted segments about media bias at least twice. The CW 59 re-airs some newscasts from Fox 26, likely including some of these “must-run” segments. CBS 29 regularly airs at least some of Sinclair “must-run” content, including nationally produced news packages, “Terrorism Alert Desk,” and “Bottom Line with Boris.” CBS 29 also airs both Sinclair-connected weekly news programs, Full Measure with Sharyl Attkisson and The Armstrong Williams Show. Fox 58 also regularly airs some Sinclair “must-run” content, including nationally produced news packages. Fox 58 also airs Full Measure. Both stations ran the recent anchor-read scripted segments about media bias numerous times. CBS 29 aired the segment at least 26 times, while Fox 58 aired it at least 16. Further north, Sinclair owns a group of four stations in the media market serving the areas around Chico and Redding: KRCR (ABC, News Channel 7), KVCU (Fox 20), and smaller stations KUCO-LP (a Univision affiliate) and KRVU-LD (a MyNetwork TV affiliate). ABC 7 regularly airs at least some of Sinclair’s “must-run” content, including national news packages, “Terrorism Alert Desk,” and “Bottom Line with Boris.” It also airs Full Measure, and it ran the recent anchor-read scripted segments about media bias at least 17 times. Fox 20 airs a nightly KRCR newscast, likely including some of these “must-run” segments. Sinclair also controls a group of four stations in the Eureka media market, which neighbors the market serving Chico and Redding. It owns KAEF (ABC 23), KBVU (Fox 28), and smaller stations KECA-LD (a CW affiliate) and KEUV-LP (a Univision affiliate.) ABC 23 and Fox 28 -- together branded as “North Coast News” -- share a website with the Sinclair-owned ABC and Fox affiliates in Chico and Redding. Data is not currently available for ABC 23 or Fox 28’s airing of “must-run” segments. ABC 23 does air Sinclair’s weekly news show Full Measure and appears to likely share some news resources with KRCR (ABC 7) in nearby Redding, which airs “must-run” content. Sinclair is set to purchase several more California local news stations via its pending acquisition of Tribune Media, including KTLA (KTLA 5, a CW affiliate) in Los Angeles, one of the largest local media markets in the country. KTLA serves parts of CA-25, CA-39, CA-45, CA-48, and CA-49. Sinclair also plans to acquire KSWB (Fox 5) in San Diego, which serves parts of CA-49. However, Sinclair has agreed to sell the station to 21st Century Fox in order to comply with current Federal Communications Commission (FCC) ownership limits. Sinclair plans to use the same strategy for KTXL (Fox 40) in Sacramento, which serves parts of both CA-10 and CA-21. It will also acquire the station from Tribune Media and has agreed to sell it to Fox. Are there Sinclair stations near you? Use Media Matters’ interactive map at FindSinclair.com to learn more. We’ve already tackled Nevada, Tennessee, New York, Florida, and Virginia. Now, we’re taking a look at Ohio. Governor: Current Gov. John Kasich (R) cannot seek a third term, and the race to elect a new governor was rated “lean Republican” by Cook Political Report as of publication (and dubbed “one of 2018’s most bizzare campaigns” by Vox.) The candidates are current state Attorney General Mike DeWine (R); former state Attorney General Richard Cordray (D), who is also the former director of the U.S. Consumer Financial Protection Bureau; and Green Party candidate Constance Gadell-Newton. House: Ohio’s first congressional district (OH-1), in the southwestern corner of the state, was rated “lean Republican” by Cook Political Report as of publication. Republican incumbent Rep. Steve Chabot faces Democratic challenger and current Hamilton County clerk Aftab Pureval and independent candidate Mike Goldschmidt. House: Ohio’s 12th congressional district (OH-12), located in central Ohio, has an open seat for the first time in 18 years after the January resignation of Rep. Patrick Tiberi (R). The seat will be filled in a special election in August, rated a toss-up by Cook Political Report as of publication. The Republican candidate is state Sen. Troy Balderson and the Democratic candidate is Franklin County Recorder Danny O’Connor. Sinclair has a hand in news programming at three news stations serving the Columbus area, including parts of OH-12. It owns and operates WSYX (ABC 6). WTTE (Fox 28) is owned and operated by Cunningham Broadcasting (another company controlled by the same family that owns Sinclair) and “receives certain services from an affiliation of Sinclair.” Sinclair also operates Manhan Media-owned WWHO (The CW Columbus). All three stations share a main studio address in Columbus. ABC 6 airs Sinclair “must-run” content, including some nationally produced news packages, fearmongering “Terrorism Alert Desk” updates, and both of Sinclair-connected weekly shows, Full Measure with Sharyl Attkisson and The Armstrong Williams Show. It also aired the recent anchor-read scripted segments about media bias at least 18 times. The CW Columbus airs ABC 6 news, very likely including the same Sinclair “must-run” content. Fox 28 also airs some Sinclair “must-run” content, including nationally produced news packages, “Bottom Line with Boris” pro-Trump commentary segments, and Full Measure. It also shares a morning newscast with ABC 6 (Good Day Columbus). Fox 28 aired the recent anchor-read scripted segments about media bias at least 14 times. Sinclair has a hand in news programming at two stations serving the Cincinnati area, most of which is located in OH-1. It owns and operates the CBS-affiliated WKRC (Local 12), and it provides “certain services” to Deerfield Media-owned WSTR (Star 64). The two stations share a main studio address in Cincinnati. 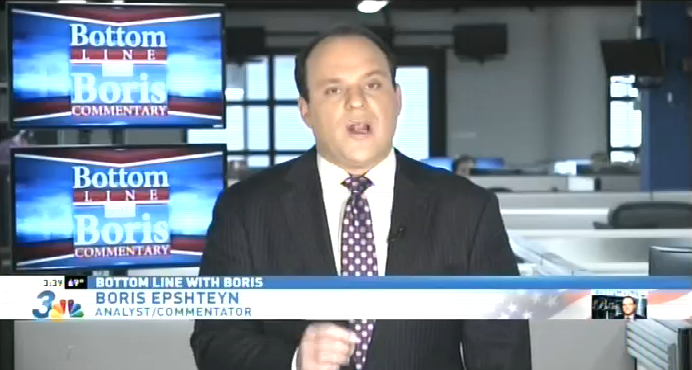 Local 12, a CBS affiliate, airs some of Sinclair’s “must-run” content, including some national news packages, “Bottom Line with Boris,” and Full Measure. It also aired the recent anchor-read scripted segments about media bias at least seven times. 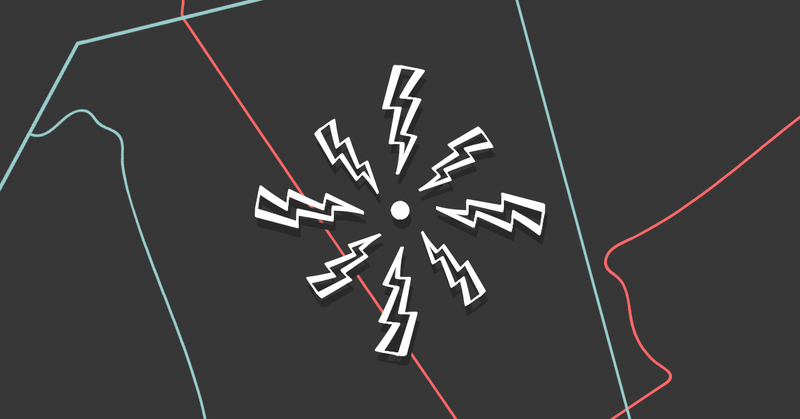 Star 64 airs Local 12 newscasts and at least some of Sinclair’s “must-run” content, including “Terrorism Alert Desk” and “Bottom Line with Boris.” It aired the recent anchor-read scripted segments about media bias at least three times. 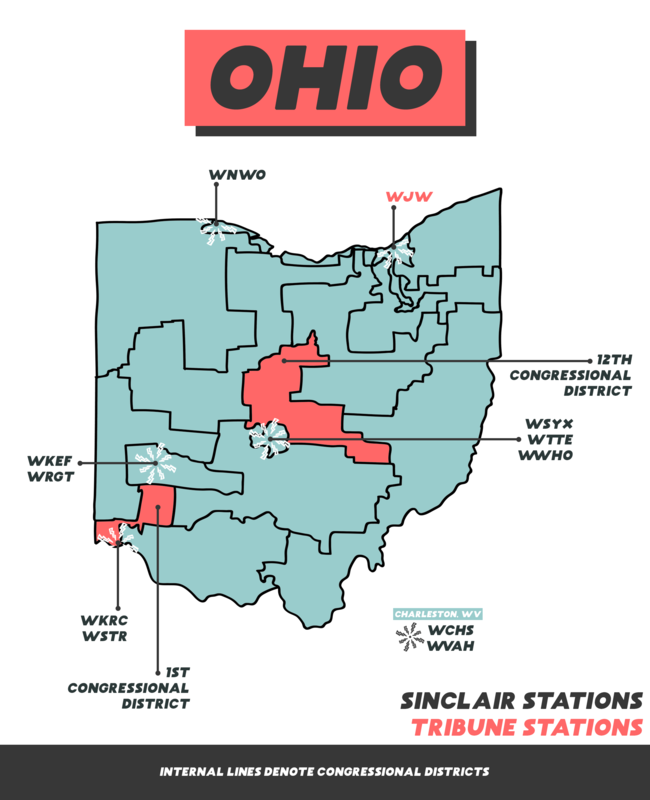 Sinclair owns and operates WKEF (ABC 22 Now) serving the Dayton area, including some northern parts of OH-1. WRGT (Fox 45 Now) is owned and operated by Cunningham Broadcasting (another company controlled by the same family that owns Sinclair) and “receives certain services from an affiliation of Sinclair.” The two stations share a main studio address in nearby Miamisburg. Fox 45 Now airs at least some of Sinclair’s “must-run” content, including national news packages, “Terrorism Alert Desk” updates, and Full Measure. ABC 22 Now airs Fox 45 newscasts and at least some of Sinclair’s “must-run” content, including the national packages, the “Terrorism Alert Desk” updates, “Bottom Line with Boris,” and both Sinclair-affiliated weekly shows: Full Measure and The Armstrong Williams Show. It also aired the recent anchor-read scripted segments about media bias at least twice. Sinclair owns and operates WNWO (NBC 24) in Toledo. NBC 24 airs Sinclair’s “must-run” content, including national news packages, “Bottom Line with Boris” segments, “Terrorism Alert Desk” updates, and the weekly shows Full Measure and The Armstrong Williams Show. It also aired the recent anchor-read scripted segments about media bias at least four times. ABC 8 airs Sinclair “must-run” content, including some national news packages, “Bottom Line with Boris” segments, and the weekly shows Full Measure and The Armstrong Williams Show. It also aired the recent anchor-read scripted segments about media bias at least eight times. Fox 11 also airs Sinclair “must-run” content, including national news packages, “Terrorism Alert Desk” updates, and Full Measure. WJW (Fox 8) in Cleveland is currently owned by Tribune Media and will soon be owned (at least briefly) by Sinclair if the company’s pending acquisition of up to 42 Tribune stations is approved. Sinclair indicated it will sell the station to 21st Century Fox after the deal goes through in order to comply with Federal Communications Commission (FCC) ownership rules. Sinclair’s track record suggests the company may continue to operate the station in some capacity through legal loopholes -- though reporting says the station will be owned and operated by Fox. The winner of the Ohio governor’s race will have significant say over state redistricting for U.S. House seats following the 2020 Census. We’ve already tackled Nevada, Tennessee, New York, and Florida. Now, we’re taking a look at Virginia. House: Virginia’s second congressional district (VA-2), which includes easternmost parts of the state around the Chesapeake Bay, was rated “lean Republican” by Cook Political Report as of publication. Republican incumbent Rep. Scott Taylor faces a primary challenger, and several others are seeking the Democratic nomination for the race. House: Virginia’s fifth congressional district (VA-5), spanning a large area in the center of the state, was rated “lean Republican” by Cook Political Report as of publication. Republican incumbent Rep. Tom Garrett faces Democratic challenger Leslie Cockburn, a former journalist. House: Virginia’s seventh congressional district (VA-7), which includes Richmond suburbs and parts of central VA, was rated “lean Republican” by Cook Political Report as of publication. Two Democrats are competing for the nomination to challenge Republican incumbent Rep. David Brat. ABC 13 regularly airs Sinclair’s “must-run” content, including nationally produced news packages, fearmongering “Terrorism Alert Desk” updates, “Bottom Line with Boris” pro-Trump commentary segments, and the weekly shows Full Measure with Sharyl Attkisson and The Armstrong Williams Show. It also aired the recent anchor-read scripted segments about media bias at least seven times. Parts of VA-7 are currently served by Sinclair-owned WRLH (Fox Richmond) in nearby Richmond. Sinclair reportedly does not produce Fox Richmond’s regular newscasts; the channel contracts with another local station for news production, so it apparently does not currently air Sinclair’s national “must-run” content. Sinclair has indicated it will sell Fox Richmond if its pending acquisition of Tribune Media stations is approved. The media company would sell the station to Standard Media in order to comply with the Federal Communications Commission’s current media ownership rules. However, Sinclair’s track record suggests the company may continue to operate the station in some capacity through legal loopholes. Sinclair currently owns and operates the MyNetwork affiliate WTVZ (MyTVZ) in Norfolk. MyTVZ does not appear to air regular local news programming, but it does air Sinclair’s weekly news show, Full Measure with Sharyl Attkisson, and the Sinclair-affiliated The Armstrong Williams Show. WJLA (ABC 7) in Washington, D.C.
ABC 7 regularly airs Sinclair’s “must-run” content, including nationally produced news packages and the weekly show Full Measure with Sharyl Attkisson and The Armstrong Williams Show. It also aired the recent anchor-read scripted segments about media bias at least 19 times. Some of the southernmost areas in VA-5 are served by the Sinclair-owned and -operated WLFL (The CW 22) and WRDC (MyRDC) based in Raleigh, NC. The CW 22 currently airs newscasts from a non-Sinclair-affiliated local station. MyRDC does not appear to air any local news programming. Coming soon: WTKR and WGNT in Norfolk, WTVR in Richmond, WDCW in Washington, D.C.
Sinclair is set to purchase Richmond-based station WTVR (CBS 6) in its pending acquisition of up to 42 Tribune Media stations. Should the deal go through, Sinclair has indicated it will sell its current Richmond-based station, WRLH Fox Richmond (and presumably keep the newly acquired CBS 6) in order to comply with FCC rules. Sinclair is also set to purchase Tribune stations WTKR (CBS 3) and WGNT (CW) in Norfolk. Its current Norfolk-based station, MyTVZ, does not air local news programming, but if Sinclair develops a local newscast, likely based at the largest station, CBS 3, up to three different channels in the Norfolk area could soon air at least some Sinclair news programming. Sinclair will also acquire WDCW (DCW50) in the Tribune purchase. Former WSET (ABC 13) reporter Suri Crowe recounted to BuzzFeed News in April that Sinclair management had insisted she add false balance in news stories about climate change and gun violence. Crowe was reprimanded for refusing to “seed doubt about man-made climate change,” as BuzzFeed put it, and add more conservative “balance” to her stories. She was ultimately forced out in 2017. Sinclair’s main operations are primarily centralized in the Beltway areas of Washington, D.C., Virginia, and Maryland. Its headquarters are located in Hunt Valley, MD, not far from its flagship station, WBFF (Fox 45), in Baltimore. And at least some of Sinclair’s “must-run” content and weekly news programming is produced at the WJLA studios in Arlington, VA, including the fearmongering “Terrorism Alert Desk” segments, “Bottom Line With Boris” pro-Trump commentary segments, many of the national news packages, and Full Measure. We’ve already tackled Nevada, Tennessee, and New York. Now, we’re taking a look at Florida. Senate: Current Florida Gov. Rick Scott (R) is challenging incumbent Sen. Bill Nelson (D) in what may be “one of the most expensive campaigns in 2018.” Cook Political Report rated the race a toss-up as of publication. Governor: The race to fill the Florida governor seat vacated by Scott is open, with 20-plus candidates currently seeking the position. The race was rated a toss-up by Cook Political Report as of publication. House: Florida’s 18th congressional district (FL-18) in southeast Florida was rated “lean Republican” by Cook Political Report as of publication. Incumbent Brian Mast (R) currently has several challengers, with the filing deadline approaching on May 4. House: Florida’s 26th congressional district (FL-26) near Miami was rated a toss-up by Cook Political Report as of publication. The incumbent, Rep. Carlos Curbelo (R), currently has several Democratic challengers. House: Florida’s 27th congressional district (FL-27) in south Florida was rated “lean Democratic” by Cook Political Report as of publication. The election is an open race with many Democratic, Republican, and independent candidates. Parts of FL-18 are served by Sinclair-owned WPEC (CBS 12), WTVX (The CW), WWHB (Azteca 48) and WTCN (My15). All four stations broadcast in the West Palm Beach/Fort Pierce media market in south Florida and share a main studio address in West Palm Beach. CBS 12 regularly airs at least some of Sinclair’s “must-run” content, including nationally produced news packages, fearmongering “Terrorism Alert Desk” updates, and weekly shows Full Measure with Sharyl Attkisson and The Armstrong Williams Show. It also aired the recent anchor-read scripted segments about media bias at least 33 times. The CW West Palm airs some of CBS 12’s daily local news programming, along with Full Measure. My15 appears to occasionally re-air some of CBS 12’s local news programming, but it does not include any newscasts in its schedule on a daily basis. The Spanish-language affiliate Azteca 48 posts local news updates online and airs Azteca-produced national news programming, but complete data about the extent of its daily local news programming is not available. WGFL (CBS 4) is owned and operated by New Age Media Management LLC but “receives certain services from an affiliation of Sinclair.” WYME, also owned by New Age Media, is a low-power station affiliated with Antenna TV and operated in some capacity by Sinclair. WNBW (NBC 9) is owned by MPS Media but is operated, in some capacity, by Sinclair as well. All three stations share a main studio address in Gainesville, and all of their schedules and information are found on the CBS 4 website. CBS 4 airs at least some of Sinclair’s “must-run” content, including nationally produced news packages, fearmongering “Terrorism Alert Desk” updates, and the weekly show Full Measure with Sharyl Attkisson. NBC 9 also airs CBS 4 newscasts and appears to air the same Sinclair “must-run” segments as CBS 4. Antenna TV does not air any local news programming. Sinclair owns and operates WTWC (NBC 40) serving the Tallahassee media market. NBC 40 does not appear to regularly air local news. It does air Sinclair’s weekly news shows Full Measure with Sharyl Attkisson and The Armstrong Williams Show. WTWC does broadcast local news branded as Fox 49 or Fox Tallahassee on a digital subchannel. Sinclair also operates, in some capacity, MPS Media-owned WTLF (The CW Tallahassee). Fox 49 and The CW Tallahassee share a website. WEAR (ABC 3) and WFGX (MyTV 35) broadcast in the media market serving Pensacola, FL, Mobile, AL, and surrounding Gulf Coast communities. ABC 3 and MyTV 35 share a main studio address in Pensacola. ABC 3 regularly airs at least some of Sinclair’s “must-run” content, including nationally produced news packages, “Bottom Line with Boris” pro-Trump commentary segments, fearmongering “Terrorism Alert Desk” updates, and the weekly shows Full Measure with Sharyl Attkisson and The Armstrong Williams Show. It also aired the recent anchor-read scripted segments about media bias at least twice. MyTV 35 airs some of ABC 3’s daily news programming and The Armstrong Williams Show. Sinclair additionally operates, in some capacity, two stations serving the same market that share a main studio address in Mobile: WPMI (NBC 15) and WJTC (UTV44). NBC 15 also airs at least some of Sinclair’s “must-run” content, including nationally produced news packages, the “Terrorism Alert Desk” updates, and Full Measure with Sharyl Attkisson. UTV 44 airs some of NBC 15’s daily local news programming. WSFL (The CW South Florida) in the Miami/Fort Lauderdale media area is currently owned by Tribune Media and will soon be owned (at least briefly) by Sinclair if the company’s pending acquisition of up to 42 Tribune stations is approved. Sinclair indicated it will sell the station after the deal goes through in order to comply with Federal Communications Commission (FCC) ownership rules to a yet-undisclosed buyer. (The New York Post’s reporting has suggested the buyer is Fox.) However, Sinclair’s track record suggests the company may continue to operate the station in some capacity through legal loopholes. 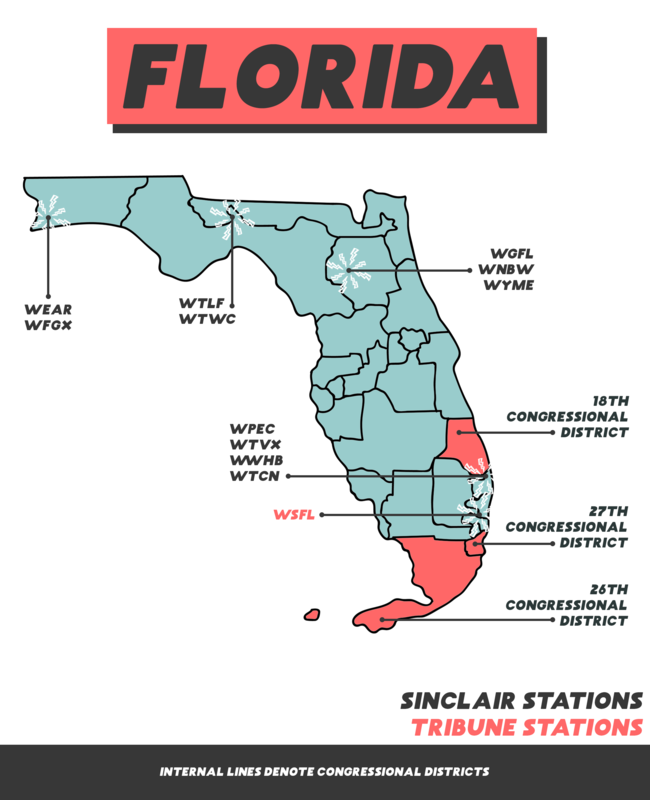 Depending on the circumstances of the Sinclair-Tribune deal, The CW South Florida could be operating as a Sinclair station serving parts of FL-26 ahead of Election Day. Sinclair’s political action committee donated a total of $4,500 to Sen. Nelson’s re-election campaign committee between March 2015 and March 2018. Nelson is the ranking member of the Senate’s Committee on Commerce, Science, and Transportation -- an important committee for Sinclair, since its jurisdiction includes the communications industry. Nelson has said Sinclair lobbied him last year in order to tamp down on potential Democratic opposition to the Tribune deal. But he has led at least two efforts by Senate Democrats in recent months that have targeted the FCC's role in regulating Sinclair's expansion. Sinclair is currently suing two former WPEC (CBS 12) reporters, claiming the former employees owe Sinclair thousands of dollars each for leaving the station before the end of their respective contracts. One of the reporters, Jonathan Beaton, cited a “clear-cut conservative agenda” in the newsroom as one reason he decided to leave. Recently leaked contracts from other Sinclair-owned stations reveal a pattern of harsh financial penalties that discourage employees from leaving or speaking out against the company. The four Sinclair-owned and -operated stations currently broadcasting in West Palm Beach are part of the local media market for Mar-a-Lago, President Donald Trump’s resort in Florida. House: New York’s 19th congressional district (NY-19), spanning the Hudson Valley and Catskills regions south of Albany, was rated a toss-up by Cook Political Report as of publication. The incumbent is Rep. John Faso (R), and there is a wide field of Democratic and independent challengers. House: New York’s 22nd congressional district (NY-22) in central New York was rated a toss-up by Cook Political Report as of publication. The incumbent is Rep. Claudia Tenney (R), and the leading Democratic challenger is current state Assemblyman Anthony Brindisi. Parts of NY-19 are served by Sinclair-owned WRGB (CBS 6) and WCWN (CW 15 New York - The Capital Region), which both broadcast in the Albany region and share a main studio address in nearby Schenectady. CBS 6 regularly airs at least some of Sinclair’s “must-run” content, including nationally produced news packages, fearmongering “Terrorism Alert Desk” updates, and the weekly show Full Measure with Sharyl Attkisson. It also aired the recent anchor-read scripted segments about media bias at least five times. The CW 15 airs some of CBS 6’s daily local news programming, along with Full Measure and Sinclair’s other weekend show, hosted by conservative pundit Armstrong Williams. 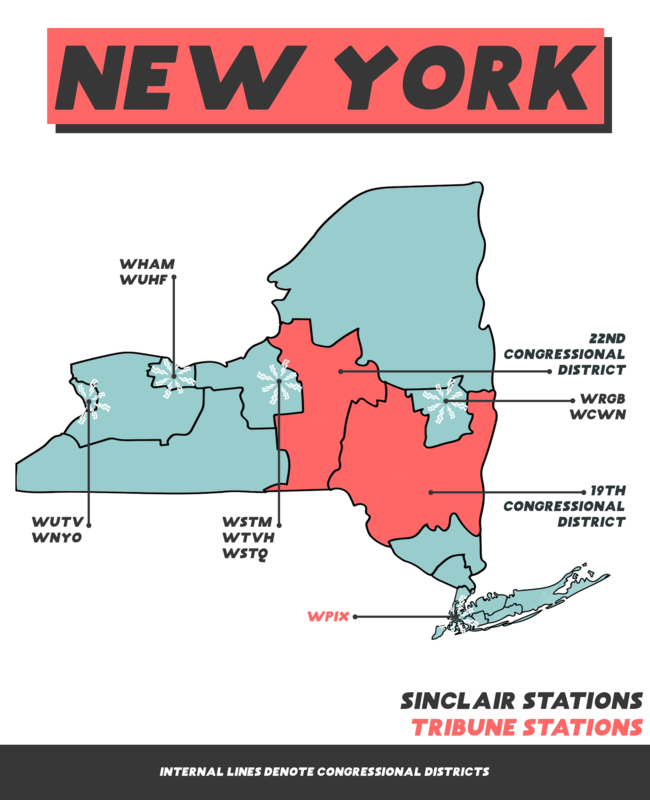 Parts of NY-22 in central New York are served by Sinclair-owned WSTM and the smaller, low-power WSTQ, as well as the Granite Broadcasting-owned WTVH, which is operated by Sinclair under a legal agreement. All three stations are collectively branded as “CNY Central,” and they share a main studio address in Syracuse. WSTM and WTVH air at least some of Sinclair’s “must-run” content, including nationally produced news packages, “Bottom Line with Boris” pro-Trump commentary segments, and the weekly show Full Measure with Sharyl Attkisson. They also aired the recent anchor-read scripted segments about media bias a collective 17 times. WSTQ also airs nightly local news programming, along with Williams’ show. Sinclair owns or operates, in some capacity, several other stations across the state apart from those in areas with key midterm races: WHAM (13WHAM ABC) and WUHF (Fox) in Rochester, and WUTV (Fox 29) and WNYO (MyTV) in Buffalo. WPIX (PIX 11) in New York City is currently owned by Tribune Media and will soon be owned (at least briefly) by Sinclair if the company’s pending acquisition of up to 42 Tribune stations is approved. Sinclair has indicated it will sell PIX 11 after the deal goes through in order to comply with Federal Communications Commission (FCC) ownership rules. However, the details of Sinclair’s plan show the company will likely continue to operate the station in some capacity through legal loopholes. Another key midterm race, for New York’s 11th congressional district covering Staten Island and parts of Brooklyn, falls within the PIX 11 broadcast range. If you live in a midsize city or battleground state, you are now more likely than ever to see propaganda bolstering President Donald Trump and conservative spin on your local news -- just in time for the 2018 election season -- thanks to conservative media giant Sinclair Broadcast Group. We’ve already tackled Nevada. Now, we’re taking a look at Tennessee. Senate: Tennessee has an open Senate seat this year, and the race is considered a toss-up by Cook Political Report as of publication. The current front-runners are U.S. Rep. Marsha Blackburn (R-TN), and former Tennessee Gov. Phil Bredesen, a Democrat. 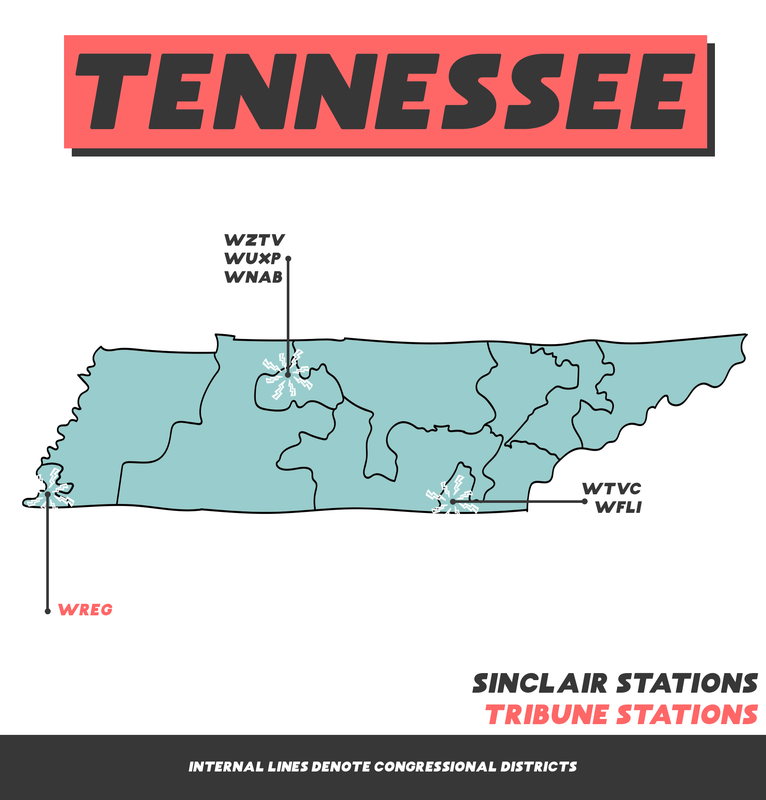 Sinclair-owned WTVC (NewsChannel 9) in Chattanooga regularly airs at least some of Sinclair’s “must-run” content, including nationally produced news packages, and it aired the recent anchor-read scripted segments about media bias. News Channel 9 also airs Sinclair’s weekly news shows Full Measure with Sharyl Attkisson and The Armstrong Williams Show. WTVC 9.2 (a subchannel of WTVC) hosts Chattanooga’s Fox affiliate, Fox Chattanooga. MPS Media-owned WFLI (The CW Chattanooga) “receives certain services from an affiliation of Sinclair” and occasionally re-airs some of Fox Chattanooga’s local news programming, such as its 10 p.m. Saturday newscasts. The two stations share a main studio address. Sinclair-owned WZTV (Fox 17) also regularly airs at least some of Sinclair’s “must-run” content, including nationally produced news packages, fearmongering “Terrorism Alert Desk” updates, and the weekly show Full Measure. Sinclair-owned WUXP (My30) shares a main studio address with Fox 17 and re-airs at least some of Fox 17’s local news programming. Nashville Broadcasting-owned WNAB (The CW58) “receives certain services from an affiliation of Sinclair Broadcast Group” and also shares a main studio address with Fox 17 and My30. It does not appear to regularly air news programming. WREG (News Channel 3) in Memphis is currently owned by Tribune Media but will soon be owned by Sinclair if the company’s pending acquisition of up to 42 Tribune stations is approved. Sinclair’s political action committee gave a total of $4,500 to Blackburn’s Senate campaign committee in 2017. Blackburn currently serves on the House Committee on Energy and Commerce, and she chairs its Subcommittee on Communications and Technology -- an important subcommittee for Sinclair. The map in this post has been updated to include Tennessee's 9th congressional district. First, we’re looking at Nevada. Senate: The contest between incumbent Republican Sen. Dean Heller and Democrat challenger Rep. Jacky Rosen is rated a toss-up by Cook Political Report as of publication. House: Nevada’s third congressional district (NV-3) south of Las Vegas is an open race rated as “lean Democratic” by Cook Political Report as of publication. Governor: Nevada Gov. Brian Sandoval (R) is not eligible to run in 2018. The election is thus an open race, and it was rated a toss-up by Cook Political Report as of publication. KSNV (NBC 3) and KVCW (The CW Las Vegas) both serve parts of NV-3. NBC 3 regularly airs Sinclair’s “must-run” content, including “Bottom Line with Boris” pro-Trump commentary segments, fearmongering “Terrorism Alert Desk” updates, and nationally produced news packages, and it aired the recent anchor-read scripted segments about media bias. Both stations air Sinclair’s weekly news shows Full Measure with Sharyl Attkisson and The Armstrong Williams Show. NBC 3 does not seem to try to distance itself from the national must-run segments. Anchors have actually introduced these segments as though they’re part of the newscast (rather than sandwiching them in during commercial time or at times with low viewership, as some other stations have been doing) and the segments have featured NBC 3 branding on the screen. Sinclair owns and operates KRXI (Fox 11). A Media Matters search of the iQ media database found that Fox 11 aired the scripted promotional segment narrated by Bill Frankmore and Melissa Carlson at least six times between March 23 and March 30. 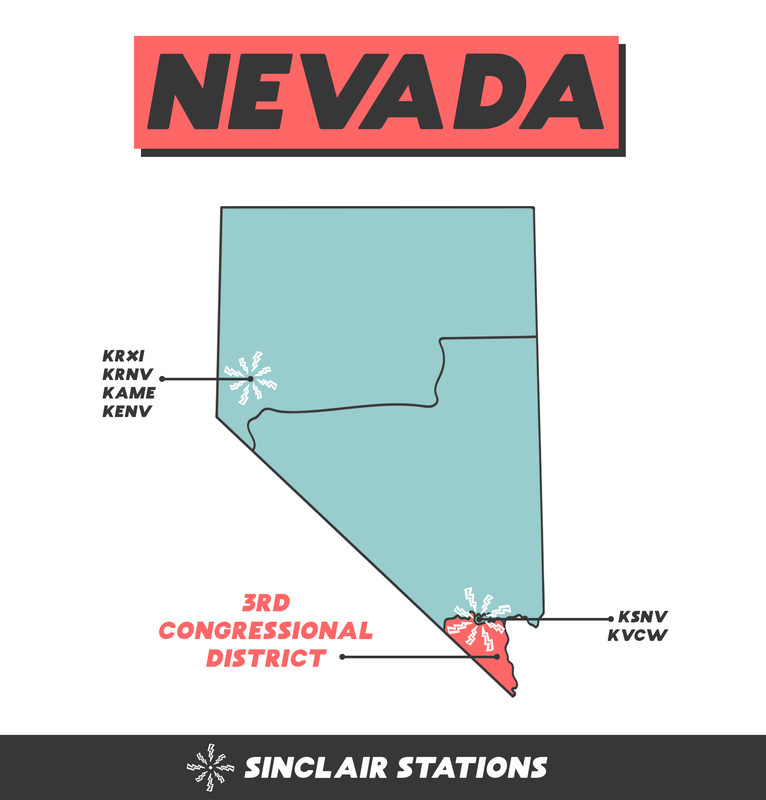 Sinclair also provides operations support for two other stations in Reno, KRNV (NBC News 4) and KAME (a MyNetwork affiliate branded as My21), through shared service agreements. All three Reno stations also share a studio space, and My21 does not appear to have its own website, instead posting its schedule on the Fox 11 site. KENV is licensed to serve Elko -- considered part of the Salt Lake City, UT, media market -- but serves as a semi-satellite to KRNV in Reno, meaning that it airs some of the same news programs but may have different branding. It also shares a studio space with KRXI, KRNV, and KAME in Reno. Sinclair’s political action committee gave $1,500 to Heller’s re-election campaign committee in September 2015. Heller serves on the Senate’s Committee on Commerce, Science, and Transportation, including on its subcommittee related to communications and technology -- an important subcommittee for Sinclair. In January and February press releases, Heller touted Sinclair, among other businesses, for giving “their employees special bonuses and raises” after the passage of the Trump/GOP tax law. UPDATE: This post has been updated to include the Nevada gubernatorial race.